Gear metering pumps and meter mix dispense systems. In 1948 Mahr created its line of metering pumps in support of Prof. Schlack who invented, in 1938, the Perlon fibre (Polyamide 6). The complete line of high-precision gear metering pumps has been manufactured under the brand name ‘Feinpruef’. Aptly named the ‘spinning pump’, the Feinpruef high-precision gear metering pump excelled in the synthetic textile industry. Known for its superior manufacturing and metallurgy, major manufacturers still choose the Feinpruef pump as their partner today. Mahr Metering Systems Corporation manufactured its first automated meter/mix/dispense system in 1992. Since this time, systems have been supplied to many diverse markets, such as adhesives, chemicals, paints, plastics, and silicones. Mahr has formed alliances with many raw material suppliers, acting jointly in research and development to create effective metering systems for new materials. During this research Mahr has found new ways to accurately meter under almost any strenuous condition, including extremes of pressure, viscosity and temperature. We offer custom design for every system to meet exact operating requirements. 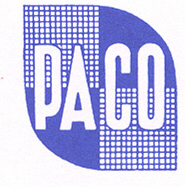 PACO Paul GmbH & Co.
PACO is a world leader in manufacturing filter media such as woven wire cloths, sintered fibre metal, mesh laminates and does also manufacture an extensive range of filter elements, strainers, spin-pack-screens, baskets, wedge wire elements and sieving equipment. Hills, Inc. is a well-known innovator in multi-component fiber extrusion technology that is devoted to the design, development, and manufacture of fiber extrusion equipment. Hills delivers the latest innovations to the fiber and nonwovens industries by supply of Filament, Staple, Spunbond, and Melt Blowing machinery. In adition to the supply of machinery, Hills routinely assists customers with product development by offering fiber and fabric trials. Hills’ in-house lab facility is equipped with the latest instruments in product development and testing. The lab facility includes a half-meter spunbond and melt blown line as wll as a half-meter filament line. Aquafil Engineering is one of the worldwide leading companies in technology and equipment design for polyamide and polyester polymer plants. Aquafil Engineering additionally offers the further processing of the polymers into fibre, film, technical and PET bottle applications. The large range of high quality services provided include know-how support, feasibility study, installation of new plants or units, modernization and optimization of existing facilities, construction, supervision and start up as well as training of personnel. Chemtex International Inc. is a Technology Transfer Company specialized in building Synthetic Fiber, Chemical, Petrochemical and Energy related plants all over the world. Chemtex partners with worlds leading technology suppliers such as Invista to build cost effective and high quality polyester fibers and resin plants. Chemtex now has installed the world’s largest polyester plant with single lines up to 1,100 tons per day. Our latest design for a single polymer line is up to 1,300 tons per day. Chemtex also has state of the art NGSS staple fiber technology that can produce high quality specialty fibers suitable for today’s markets. With offices in USA, India and China, Chemtex can provide full services for projects all over the world.